Q. What is the Wisconsin Boating Safety Certificate? A. The Wisconsin Boating Safety Certificate (also known as the Wisconsin Boating License or boaters license) is proof that you have met the mandatory boat safety education requirements for the State of Wisconsin. The Wisconsin Boating Safety Certificate is good for life and does not need to be renewed. 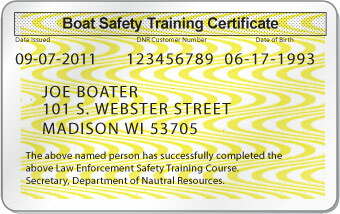 A.The boater education card is proof that you have successfully completed a boating safety course. The boater education card does not expire and does not need to be renewed. Therefore, it is NOT a Wisconsin Boating License! Q. I do not have a driver's license. Can I still get the Wisconsin Boating Safety Certificate? Q. How can I get my Wisconsin Boating License? Q. Who needs a Wisconsin boater license? A. Any operator of a motorboat or personal watercraft (PWC) who was born on or after January 1, 1989 must have a valid Wisconsin Boating Safety Certificate (boating license). For more information please consult the Wisconsin boating laws and regulations page. Q. What is a Wisconsin DNR number and how do I get one? A. The Wisconsin DNR number is a lifetime customer number that is issued when you purchase a license or certificate from the DNR. This 9-digit number is located on all DNR licenses, certificates, and permits, including hunting & fishing licenses, as well as snowmobile or ATV registrations. Before you can purchase your boating license, you must provide us with your DNR number. The DNR will NOT send you a boating safety certificate if you do not have a DNR number. If you do not currently have a DNR number or do not know your number, you can obtain your DNR number online. A. There is a one-time fee of $29.95 paid to BOATERexam.com®. It includes unlimited free attempts at the final exam. Learn more about BOATERexam.com's Risk-Free Policy. A. You need a grade of 80% or higher on the boating license test to pass. That means 48 correct answers out of 60. Q. Is anyone exempt from obtaining the Wisconsin Boater License? A. Yes, there are certain exemptions from the boat safety education requirement. For more information, check out the Wisconsin Boating Laws page.